At the end of 2016, Vodafone was hit by a £4.6 million fine after being found guilty of failing its pay as you go customers and failing to ensure its customer service staff were trained to properly handle user complaints or settle disputes. Since 2010 Vodafone has been criticised for their awful customer service. In fact, figures from Ofcom, the industry watchdog, showed that in 2016 Vodafone retained its reputation as Britain’s worst mobile phone operator for customer service for a second year. They racked up more than double the number of complaints as their closest rival. I can attest first hand how utterly woeful Vodafone customer service is. The experience of dealing with the company has already made me lose my mind. When I finally experience death by call-centre my epitaph will read ‘With sweet mercy he escaped from Vodafone’. I feel like I have spent around two days of my life in total attempting to claim £29.83 credit owed to me by Vodafone. First of all it was a bore trying to get Vodafone to pay the money they owed me after moving to another provider in 2014 (for the record I moved to EE who have been excellent so far). But now it has become a matter of both principle and comedy. Vodafone sent me a credit note almost 2.5 years ago, but seemingly able to take payment from my account in seconds, they appear incapable of sending money in the other direction. After leaving Vodafone in 2014, I received a credit note from Vodafone for £29.83. However, no money arrived into my account after a few weeks so I called customer services. After spending the best part of an hour on the phone, I was given an apology and told that the money would be put in my account but will take a month. No money arrived into my account for a more than six weeks so I called customer services. After spending another half an hour on the phone, I was told that the money would be in my account within a month. Repeat after a month (with increasing rage). Repeat after a month (my head is close to exploding). Repeat after a month (this is becoming a matter of principle). Repeat after a month (I’m close to tears whilst on hold, again). Repeat after a month (close to giving up and letting Vodafone keep my money). Then a bombshell. After almost two years of chasing my refund I was told that there was no record of the refund/credit because my account ‘was an old one’. I was advised that I should take my credit note to a local store for them to verify and refund me. I queued up (end of Dec 2016) in local Trowbridge store for 40 minutes (with my toddlers – we were I there so long one of them wet himself in the pushchair – absolute hell) only to be told they couldn’t refund me and weren’t sure why I had been told to come to the store. After a short protest, the covering store manager called customer services on my behalf and I am told I will have a refund to my account within a month. Refund doesn’t arrive after a month. I went back and queued up in my local Trowbridge store (Feb 2017) for 23 minutes (without toddlers this time!) only to be told they couldn’t refund me and weren’t sure why I had been told to come to the store. 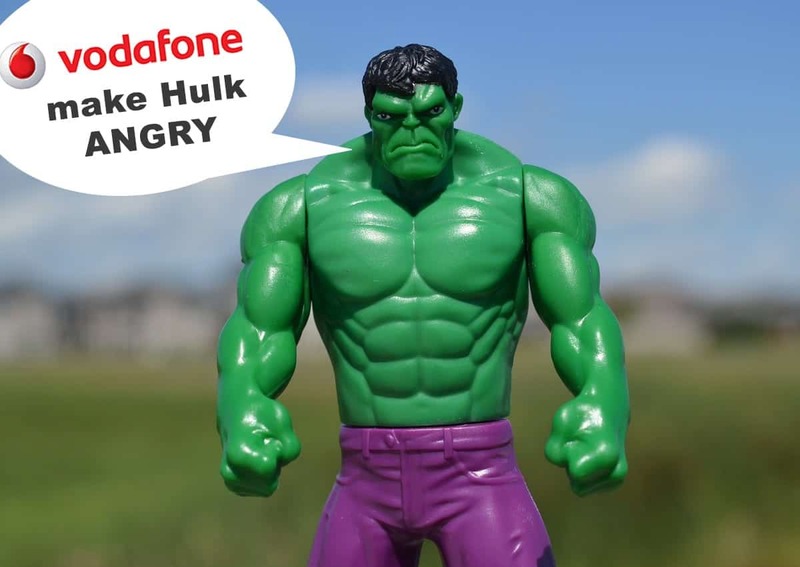 I was told that my best course of action was to make a complaint to Vodafone customer services and that they will probably compensate me in some way for the distress and time wasted. I make a formal complaint detailing the above. Receive a letter on 23rd of march (ref number 1-577485491815) asking me to call customer services because they were ‘unable to connect’. Call customer services and (after being on hold for a while) was asked to explain what my complaint is for (my head almost falls off and I want to jump out of my office window). After arguing over the amount owed (they were trying to knock £1.32 off the amount on the credit note) the customer service operator told me that the money will be in my account in three working days. Not so pleasing was that after a full scale argument where she refused to acknowledge that Vodafone are at fault, she informed me that I am not eligible to receive any form of compensation because I am no longer a Vodafone customer. It’s now April 24th, over a month later (+ 2.5 years)…. Still no refund. Given Ofcom’s reported figures, it seems that many customers can expect to receive poor customer service if taking up a contract with Vodafone. But in my first hand experience, the poor customer service continued long after leaving them. Should you leave Vodafone and still experience difficulties it seems you also won’t be entitled to any compensation because you are no longer a customer (that’s their policy according to the customer service complains operative I spoke to). We have asked Vodafone for comment but they haven’t replied, yet. Maybe it will be in my inbox next month? So, after this article was shared quite a few times on Twitter, Vodafone’s Twitter Customer Service account PM’d us to ask for the account number so they could resolve the issue. We sent them the details and waited to see what would happen. Guess what… nothing happened! I’m still waiting for a refund. Watch this space for more updates, but don’t hold your breath. Maybe see you back here in another two and a half years?